We are leading manufacturer of best quality range of Heat Reflective Coating. Heat Reflective Coating are used on roof as a heat reflector, which helps in reducing temperature. During peak summer time Heat Reflective Coating will maintain the average temperature below the normal. Heat Reflective Coating also provide extra protective layer to the surface. Star Cool shield has been Certified as Highest in Solar Reflectance Index,SRI Value - 130, tested by NABL Certified lab as per ASTM/LEEDS perstandards for green buildings. 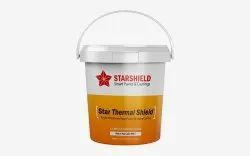 Moreover, STAR COOL SHIELD is having Nano Air-bubbles inside the coating, which creates air vacuum within the coating &doesn't let the heat to pass through it & is alsoheat resistant upto 125 degrees & because of using Water proofing fibers as a fillers in the coating, it is resistant to water & 4 other liquids also. Due to this, thecoverage of Star Cool Shield is 10%more than other similar coatings. & it costs just around Rs.12.30/- per sqft. in double coat only. We are manufaturer and suppliers of the best quality of Heat Resistant Tile coating paints.